In Germany, the public debate centres around the common claim that the crisis countries had been living beyond their means for a number of years. While it is accurate to assess that the previous credit-financed boom led many people in Ireland or Spain to believe that their economy was on a healthy and ever-increasing upward trend, accusations that crisis countries had celebrated a lavish party are inaccurate and ill-founded. While experiencing only moderate real-wage growth before the crisis, lower and middle income groups now pay a high price for the hybris of banks and other investors. But also governments and international organisations thought that economies could not grow fast enough, even if there was the risk that everything collapses like a house of cards. As a matter of fact, based on the scope for wage increases Germans and Austrians live less than within their means, i.e. the sum of productivity growth and the inflation target of the ECB (close to 2%), was anything but exhausted in Germany and Austria. But lower wages imply depressed consumption and lower domestic demand. Because of higher domestic demand (German and Austrian) investors were rushing to Southern Europe and Ireland. The dynamic economic growth promised higher yields, but in the end capital from northern Europe mainly fuelled a property bubble. The resulting buoyant import demand in those countries also explains to some extent recent export success in both Germany and Austria. 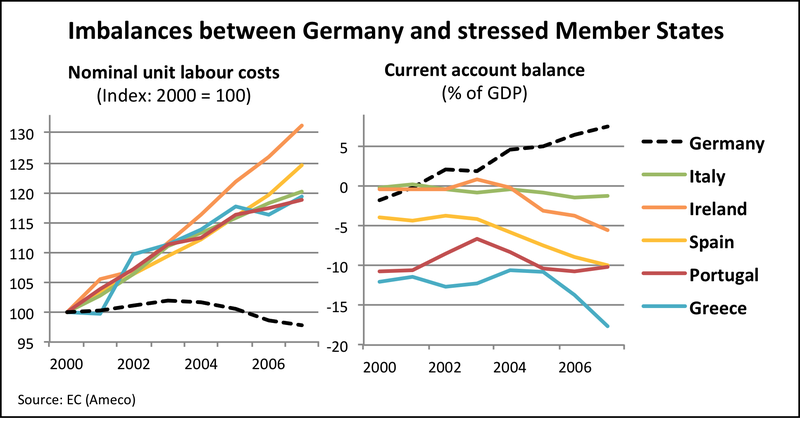 Until the onset of the global financial crisis in 2008, real wages increased only very weakly in Germany compared with the rest of the euro area. But this development cannot be blamed on the euro. Instead, wage restraint was an explicit policy objective of the government and social partners (keywords: Alliance for Jobs and Hartz IV). But already in the 1990s, net real wages had hardly increased in Germany and they even decreased in the years 2004-08! Never before in German history was a strong economic expansion associated with such a persistent reduction in net real wages over so many years.